Working out what you want to do when you grow up can be kinda hard. After all there’s so many possibilities. Especially if you’re Big Bird and you’ve lived on Sesame Street all of your young life, where your told every day you can be and do anything you want. 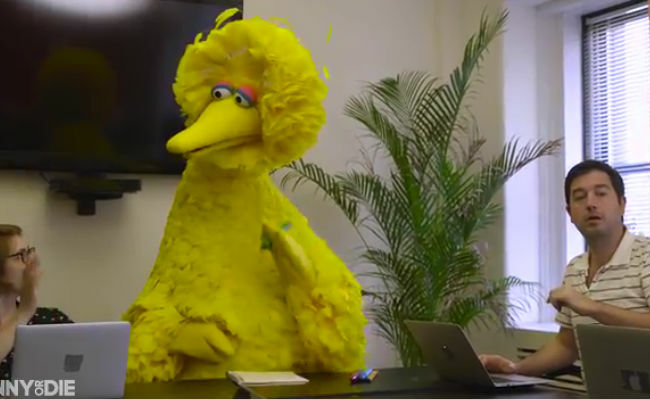 That kind of anything is possible mindset if probably dear sweet Big Bird announces to the comedy writing team at Funny or Die that he wants to be all kinds of things when he grows up. The final two are eminently doable but the final one? Well he has got a great can do attitude and is a whiz with crayons – his first sketch however doesn’t quite meet Funny or Die’s definition of the word alas – but he may not quite have what it takes to make in the world of comedy. Oh yeah and he may a little too young to be an intern. But hey you have to admire his optimism and chutzpah. I think he’ll do well once he gets the whole sketch thing down.